Noskov M. V., Somova M. V., Fedotova I. M.
The article proposes a model for forecasting the success of student’s learning. The model is a Markov process with continuous time, such as the process of “death and reproduction”. As the parameters of the process, the intensities of the processes of obtaining and assimilating information are offered, and the intensity of the process of assimilating information takes into account the attitude of the student to the subject being studied. As a result of applying the model, it is possible for each student to determine the probability of a given formation of ownership of the material being studied in the near future. Thus, in the presence of an automated information system of the university, the implementation of the model is an element of the decision support system by all participants in the educational process. 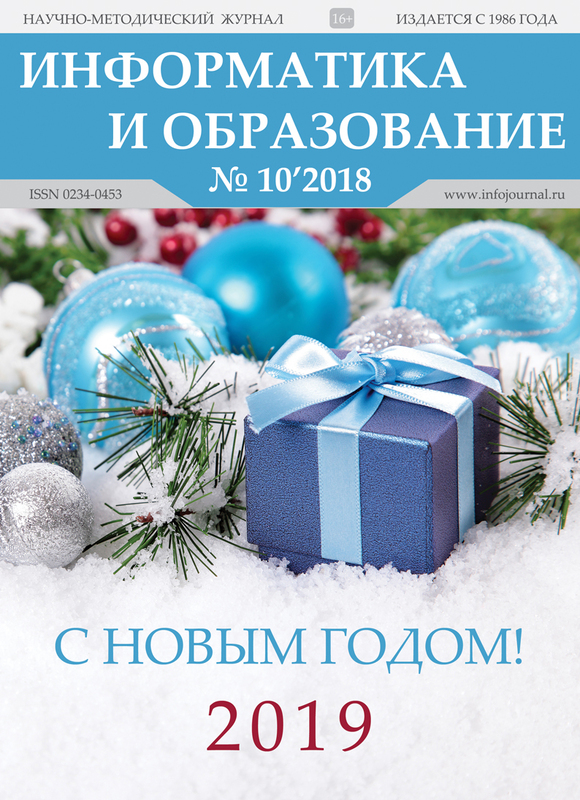 The examples given in the article are the results of an experiment conducted at the Institute of Space and Information Technologies of Siberian Federal University under conditions of blended learning, that is, under conditions when classroom work is accompanied by independent work with electronic resources. Keywords: forecasting success of learning, Markov process, Kolmogorov equations. Koliada M. G., Bugayova T. I. The hierarchy of learning motives plays an extremely important role for a management of productive activity of learners, their activity and purposefulness. In the process of educational work, such a motivational hierarchy is formed, where some motives are dynamic mechanisms of other motives that are very difficult to identify at the intuitive level, especially considering the influence of each of them. Therefore, to determine the most significant hierarchical sequence of motives, an innovative method was proposed which is based on the ideas of artificial intelligence. As an example, the search was implemented based on the so-called algorithm of imitation roasting, which is capable to take into account the probabilistic nature of motivational indicators. The article highlights the main leading educational motives of students, on the basis of which the “mechanism” of finding their optimal hierarchical system is shown, and one that simultaneously takes into account the multifactorial influence of their driving causes, taking into account their interconnection, interaction and dynamism. A step-by-step realization of construction of such a hierarchical system of main educational motives in combination with casual, minor motives which are difficult for expecting or providing in advance is shown. Given their unpredictability and probabilistic nature of occurrence, the proposed system of intelligent search allows you to select exactly those sequences of motives that provide the highest productivity and effectiveness of training. The value of the proposed algorithm of imitation roasting is that the accuracy of the result is sacrificed, but the number of iteration cycles decreases, which plays a large role in processing a significant number of motivational indicators. Keywords: motive, motivation of training, hierarchy of motives, the mechanism of dynamic balance, artificial intelligence, algorithm of imitation roasting. Sabitov R. A., Smirnova G. S., Elizarova N. U., Korobkova E. A., Sabitov Sh. R., Sirazetdinov B. R.
The concept of university training in technical specialties in the conditions of digital transformation is proposed. The basic principles of creating an integrated intellectual system for training specialists are considered: timely and flexible satisfaction of the needs of a rapidly changing economic situation; obtaining the higher education demanded in the society by all those who really prepared for it; combining the processes of targeted training and retraining and higher education; providing full selective pre-university training for admission to engineering specialties of universities; employment of technical specialists — graduates of the university in their main profile on conditions that exclude their emigration to other countries for financial reasons. To solve these problems, it is proposed to create an integrated intellectual system for training specialists (IISTS), based on modularity and learning variability; multidisciplinary teachers in special disciplines, participation of leading teachers in industry-specific and fundamental research and development with basic enterprises, monitoring and evaluating students’ knowledge in the continuous feedback mode, graduates marketing, intellectualization of training and retraining of personnel during the full life cycle of a specialist. Keywords: intellectualization of knowledge, digitalization, education, requirements for training of engineers, competencies. Brovka N. V., Dyachuk P. P., Noskov M. V., Peregudova I. P.
The problem and the goal. The urgency of the problem of mathematical description of dynamic adaptive testing is due to the need to diagnose the cognitive abilities of students for independent learning activities. The goal of the article is to develop a Markov mathematical model of the interaction of an active agent (AA) with the Liquidator state machine, canceling incorrect actions, which will allow mathematically describe dynamic adaptive testing with an estimated feedback. The research methodology consists of an analysis of the results of research by domestic and foreign scientists on dynamic adaptive testing in education, namely: an activity approach that implements AA developmental problem-solving training; organizational and technological approach to managing the actions of AA in terms of evaluative feedback; Markow’s theory of cement and reinforcement learning. Results. On the basis of the theory of Markov processes, a Markov mathematical model of the interaction of an active agent with a finite state machine, canceling incorrect actions, was developed. This allows you to develop a model for diagnosing the procedural characteristics of students ‘learning activities, including: building axiograms of total reward for students’ actions; probability distribution of states of the solution of the problem of identifying elements of the structure of a complex object calculate the number of AA actions required to achieve the target state depending on the number of elements that need to be identified; construct a scatter plot of active agents by target states in space (R, k), where R is the total reward AA, k is the number of actions performed. Conclusion. Markov’s mathematical model of the interaction of an active agent with a finite state machine, canceling wrong actions allows you to design dynamic adaptive tests and diagnostics of changes in the procedural characteristics of educational activities. The results and conclusions allow to formulate the principles of dynamic adaptive testing based on the estimated feedback. Keywords: Markov process, finite automaton, current state probability, reward, activity, active agent. Yakunin Yu. Yu., Pogrebnikov A. K.
Keywords: personal learning environment, educational process, feedback. Abdurazakov M. M., Gadjiev D. D., Tsvetkova O. N., Tokmazov G. V.
Under the influence of the general informatization of education, the creation of the information educational environment (IEE) and the issues of preparing teachers for professional and pedagogical activity are taking place and how its functionality changes in IEE remain at the center of attention of research. One of the objectives of this article is the attempt of the authors to reveal the content, features, meaning, role of the concept, the influence of various factors on the functional of the teacher in the conditions of informatization of education. A modern teacher in his work faces a whole layer of problems: from the introduction of the Federal State Educational Standards to the implementation of the main educational programs, the creation of teaching materials like teaching staff of the Federal State Educational Standards, the choice of appropriate methods and means of organizing education, etc. A modern educational institution is required to introduce new approaches to learning, which, along with fundamental training and compliance with the requirements of the Federal State Educational Standard, provide an information-educational environment. Therefore, the readiness of the teacher for professional activity is considered by us as professionally and personally significant qualities of a university graduate, as knowledge and skills in a particular field, and ICT competence as a readiness for innovation activity. Keywords: informatics, professional activity, information educational environment, pedagogical and information technologies.